It’s a well-known photography tip that scheduling shoots around sunrise and sunset will often yield gorgeous soft light, and yet most people neglect the first hours of the day because they’re so early. Waking up with the sun, especially during summer months, feels wrong. The streets are deserted, all the shops are closed, and suddenly each breath and click of the shutter seems loud in the quiet. And yet, on my first full day in Vancouver, I woke up at 5:15am and drove to Granville Island to catch the sunrise. The island was quiet–not only was it early, it has the added element of being a strictly industrial and commercial (not residential) area, which means it doesn’t start to truly wake up until about 8. Besides some geese, I had the entire place to myself, which was both peaceful and a bit spooky. While the island is very industrial, it’s also got an artistic feel. Emily Carr University of Art & Design is housed on Granville Island, and there’s an edgy vibe in the street art and the architecture of the buildings. An alleyway behind the university had about ten graffiti’d poles and some crates that were just begging for me to shoot them. I couldn’t resist. Street artists have taken these ordinary fixtures and turned them into art, and the city of Vancouver followed suit. As part of the Vancouver Biennale, the city paid OSGEMEOS–Brazilian brothers & graffiti artists–to transform the six huge silos on the Ocean Construction lot into enormous murals of giants. Granville Island is a place where industry meets art, and the unusual collision of the two is beautiful. It’s absolutely worth paying this little commercial island a visit–even if you don’t go at sunrise. Urban shots are really fun, they tend to be more dynamic than nature shots. I love the early morning but I also like sleeping in. It’s a battle. Those giants look a bit like minions. Those painted silos are incredible! They’re ENORMOUS. I love that they spruced them up. I got up early two of the four days I was in Vancouver and that was as much as I could handle. They should definitely do that in Portland! Beautiful pictures! I really need to make a Vancouver trip happen soon! Great photos, and absolutely travel inspiring. I have been aching to take a trip up North anyway! It’s a wonderful place to visit! Awesome — unexpected. :) I hate getting up that early, but I’m usually pretty happy when I actually do it and go somewhere. Because I woke up naturally it didn’t bother me that much, but I was pretty freaking exhausted by noon. Love Granville Island! Great shots! That curvy building in the first photo reminds me of one near me, which looks like a crushed pop can. :) Thanks for sharing those great photos! It does have a pop can look to it! I never noticed before. Thanks Britta :) I would’ve felt the same if it was my own bed but I was on a pullout couch so not quite the same. i’m loving these photos! i’ve never visited but it looks awesome! 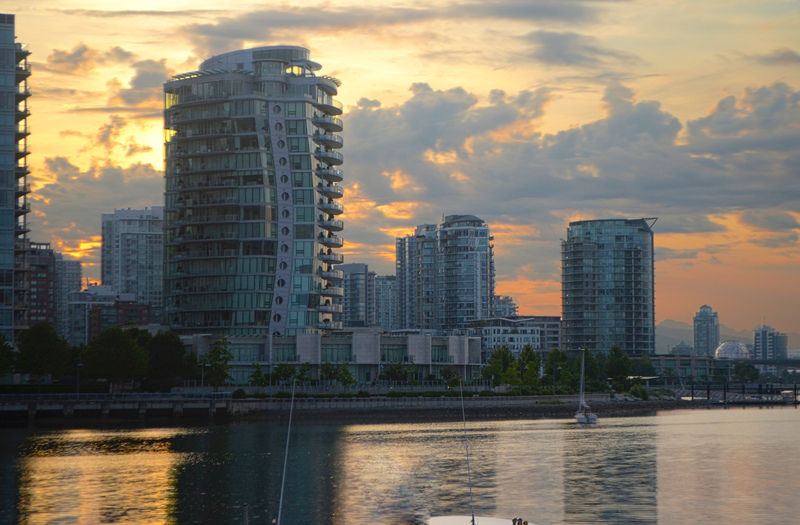 Are you doing an internship in Vancouver? 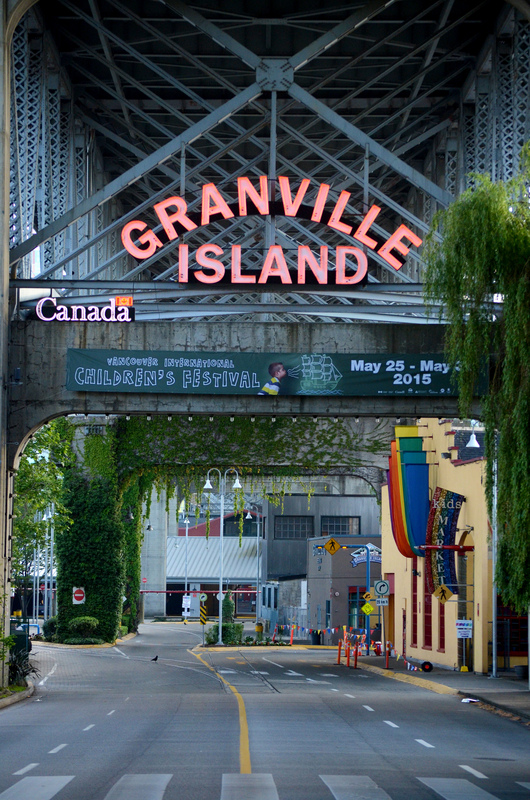 I remember going to Granville Island, it’s a neat place. I really to go to Toronto! I love Canada. Nope, I just visited for a long weekend & these posts are coming out once/week until I’m done! Because it’s so empty, yes! Great photos! I especially love the stairs!